As Peyton Manning congratulated Drew Brees in a hilarious video, the likes of LeBron James and Brett Favre used Twitter to laud the New Orleans Saints quarterback. 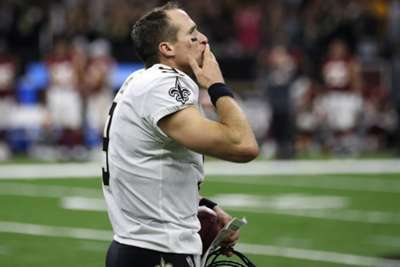 Brees became the NFL's all-time passing leader, beating Manning's mark of 71,940 yards, during the second quarter of the Saints' clash against the Washington Redskins on Monday. Manning paid tribute to the 39-year-old in a video, but the plaudits were far-reaching. The likes of James, Favre, Seattle Seahawks QB Russell Wilson and NBA star James Harden were among those praising Brees on Twitter. Salute @drewbrees!! Congrats on the achievement/milestone. Sheesh that’s a lot of passing yards!! Legendary, congrats @drewbrees! keep it going.